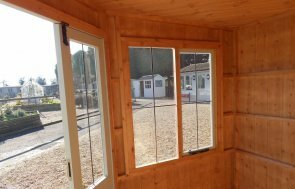 This National Trust Lavenham Summerhouse has recently been installed in our customer’s, wonderful rural garden in East Chiltington, East Sussex. 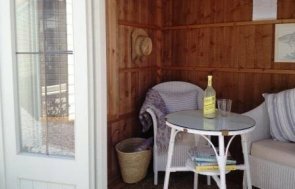 The Lavenham has been installed, tucked away in a remote corner of their garden, which will give the customer a nice, quiet little hideaway for them to escape to for a bit of peace and relaxation. The Lavenham has got an apex roof, a set of double doors on the front side with a window on both sides of the doors and another window in both gable ends (the windows in the gable ends can be opened). This particular summerhouse is 2.4 x 3.0m, which is the largest size in this style that we do, so the customer will have plenty of room inside to decorate it as they wish to. The Lavenham, as part of the National Trust range of garden buildings, is very traditional in style, and really suits this rural, rustic garden style. The traditional features of the Lavenham include the black corrugated roofing material, black cast iron door and window furniture in the Fleur-de-Leys style and vertical sawn boards for the cladding. To fit in nicely with the green of the grass, bushes and trees around it, the customer wanted the summerhouse to be painted in Wades Lantern; this is one of the six National Trust paint colours that we offer. There are also three more Summerhouses and four Garden Sheds in the National Trust range to choose from if this Lavenham isn’t quite the right style/shape/size for your garden. If you prefer more traditional looking garden buildings, then the National Trust range could be the one for you to choose from. If you would like to know more about this range, please don’t hesitate to Contact Us or call us on 01760 444229, so that you can speak to our helpful team about your requirements.